Fig. 7-14. 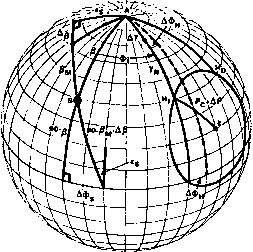 Bolometer Offset Model Geometry the rotation angle about the spin axis from the Earth-in to the nadir vector, and L0 is the rotation angle about the spin axis from the nadir vector to the Earth-out. where is the wheel rate, ws is the body spin rate, and <PS is the phase of the bolometer offset. For a fixed bolometer position, the four unknowns in these equations are t), L„ L0, and B. Equations (7-54) and (7-55) determine B and L0 in terms of L,, and these are substituted into Eq. (7-53), whereupon tj and L, are solved for, usually in an iterative fashion. Alternatively, for a fixed spacecraft attitude, the observed WHS data may be used to compute the bolometer offset parameters o and <&fl (Liu and Wertz ). In this section, we describe observation models for the following Sun sensor/horizon sensor rotation angle measurements: Sun-to-Earth-in, Sun-to-Earth-out, and Sun-to-Earth-midscan. Related azimuth biases are discussed for body-mounted horizon sensors and panoramic scanners (Section 6.2). For additional modeling procedures, see Joseph, et a/., . In every case, the observable quantity is a time difference, A/. 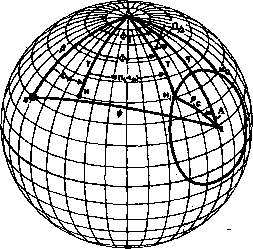 For the Sun-to-Earth-in model, A/= — ts, where t, is the horizon-in crossing time and ts is the Sun sighting time. (Note that these times are measured by different sensors at different orientations in the spacecraft.) For the Sun-to-Earth-out and the Sun-to-Earth-midscan models, t, is replaced by the horizon-out crossing time, rQ, and the midscan crossing time, tm = 1 /2(t, +10), respectively. is provided by an ephemeris (Section 5.5) evaluated at / = ts, and H, is calculated below. Equation (7-57a) is dien obtained by dividing Eq. (7-J7c) by Eq. (7-57b). Because Eq. (7-58a) is the law of cosines applied to the spherical triangle A EH, in Fig. 7-15» the phase angle A must be the rotation angle about E between A and H,. Due to our choice of the unit vectors M and N, the negative sign in Eq. (7-58c) is associated with Hf and the positive sign with Hc. 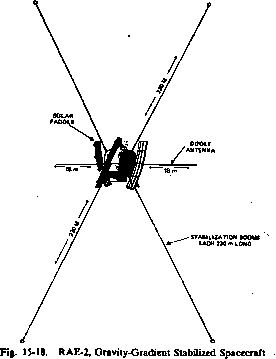 The nadir vector E is determined from the spacecraft ephemeris. The quantities r>, ft, and are computed from ephemerides evaluated at the proper times. bias on pc, resulting primarily from a constant bias on the triggering threshold of the horizon sensor (see Sections 6.2 and 7.2).